Many people who are arrested for a domestic violence crime have never been arrested before in their life. This is why it is imperative when you are charged with a domestic violence crime or under Police investigation for any allegation concerning domestic violence that you contact an experienced Norwalk domestic violence defense attorney. People who are ensnared in domestic violence cases are typically not career criminals and usually have no prior experience with the criminal justice system. Being arrested and facing the criminal justice process can be an overwhelming and stressful experience for anyone. If you combine this ordeal with the familial upheaval and separation from your loved ones that comes along with criminal orders of protection it really can be a complete nightmare. Regrettably, the State’s bureaucracy seemly takes weeks to distinguish between a seemingly harmless verbal disagreement between a married couple on the one hand and a serious case of ongoing domestic violence with a pattern of physical abuse on the other. Often becoming involved in the system can be the start of a long and difficult process to clear your name and extricate yourself from the Court’s domestic violence bureaucracy. If you are facing this ordeal having the advice and counsel of a Norwalk domestic violence defense lawyer can make the process not only less stressful for you but in many cases you can get a better resolution of your case. Once the Police get involved with an investigation of a domestic violence incident they are required by law to make an arrest if they find probable cause that any crime has occurred. This is in direct contrast to non-domestic violence crimes where the Police are afforded some degree of latitude and can exercise discretion to not make an arrest particularly when the victims no not want to “press charges” or make statements. In domestic violence investigations the police most often are informed of the occurrence of crimes from 911 calls either from the victim or third parties who have witnessed of heard the domestic dispute. Most domestic violence arrests are the result of a 911 call. By the very nature of the crime of domestic violence it involves family members and often these crimes occur within the sanctity of the home. Infrequently Police will witness a domestic disturbance while on patrol. Once a 911 call is made and Police respond upon the scene of a domestic violence crime a process has been set in motion that takes a life of its own. At that point the Police will begin their investigation to determine if they find probable cause that a crime has occurred. For this reason it is always important to remain silent and refuse to answer any questions without the presence and advise of a Norwalk domestic violence defense attorney. It is important to realize that in domestic violence investigations it is totally irrelevant what the victim’s position is on whether or not they want an arrest made or want to “press charges” or cooperate with the investigation. The rational is that the criminal action is being undertaken by the State of Connecticut and not the victim of the crime. Statistically, studies have shown that many victims of domestic violence will not cooperate with the Police and will not seek to have their abuser arrested. When Police begin their investigation they are looking for the evidence of a physical attack which can take the form of marks, scratches or bruises, broken plates, doors and the like. In addition the Police will interview any witnesses to the crimes who may have overheard the dispute and the parties themselves. Remember, if you are under investigation for any crime, including a domestic violence matter, you have the Constitutional right to remain silent and not answer any questions without a lawyer present. Before you answer any questions contact an experienced Norwalk criminal defense attorney to give you guidance and advice on how to respond. Top Norwalk criminal defense lawyers will agree that under Connecticut law if the Police find probable cause that a domestic violence crime has occurred then they are required by law to make an arrest. 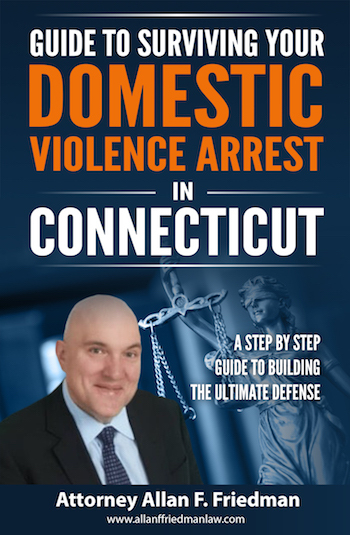 Our State Legislature has enacted the so called “mandatory arrest law” in Connecticut which requires the Police to make an arrest in each and every instance where probable cause is found that a domestic violence crime has occurred. As mentioned previously the input of the victim and the desires of the victim and the rest of the family are of no concern. If the victim tells the Police that they changed their mind and want to “drop” the charges it will not stop the arrest from happening. Similarly the desire of a victim to have an arrest made has zero impact on the decision to make an arrest. The only factor which determines whether or not an arrest will be made is whether the Police find probable cause that a crime has occurred. All of this mandatory arrest procedure is a byproduct of previous years when the Police would not take action in domestic violence cases and leave victims to continue to be abused. As a result the Legislature has taken all discretion out of the hands of the Police and mandated them to arrest each and every individual who they find committing a domestic violence crime in this state. Sadly, a very regrettable byproduct of this “mandatory arrest” policy initiative is that in many situations the Police are forced to arrest the victims of domestic violence crimes who were the ones who called 911 in the first place. The problem with the current state of the law in Connecticut is that if the Police find probable cause that the victim engaged in criminal activity, be it breach of the peace by engaging in a screaming match or an assault by fighting back against their attacker they are required by the mandatory arrest statute to arrest the victim also. Alarmingly the rate of dual arrests in Connecticut is 10 times the national average. In 30% of domestic violence arrests state wide the Police are making dual arrests in domestic violence cases. They leave it for the Court system to sort out who is right and who is wrong and who will be punished. The problem of course is that it is a horribly unfair and ridiculous outcome for a victim of domestic violence for help and then wind up getting arrested and having to hire a lawyer and go to Court to get their arrest record dismissed and take time off from work and go through the stress of dealing with the Court system. If you are caught up in the domestic violence court process it is time to contact a Norwalk domestic violence criminal defense attorney to schedule a free consultation to go over the facts of your case and get some solid legal advice. Top Norwalk criminal defense attorneys will agree that as far as the arrest process in Connecticut there are two routes in which the Police can make an arrest. The first occurs when the crime occurs within the direct observation of the Police officer or is based upon what is known as the “speedy information” received by the Police during the course of promptly after the commission of the crime and is of such nature that the Police officer can reasonably rely upon it as true. In these situations the Police can make a so called “on site” arrest. Generally, “on site” arrests must take place within a reasonable period of time from the criminal act in order for the arrest to fall within the “speedy information” doctrine. Often the Police will contact the perpetrators of domestic violence crimes who have fled the scene by cell phone to ask them to return to “give their side of the story” or some other guise because they need to arrest them quickly. If you have been contacted by Police your first call should be to a Norwalk domestic violence criminal defense attorney to seek legal guidance before speaking with Police. If too much time passes the Police are forced to use the second method of seeking an arrest – applying for an arrest warrant. In every instance in which probable cause has been found for the commission of a domestic violence crime or the violation of an order or protection the Police must type up an arrest warrant application and submit it to the State’s Attorney for approval. Thereafter, if the State’s Attorney finds that probable cause exists the warrant will be signed by the State’s Attorney and sent to a Judge of the Superior Court who will review the warrant to determine if there is probable cause for the arrest and then often the Judge will set the bond amount and any conditions of your release. In many cases when a warrant has issued for your arrest the Police will contact you and provide you with an opportunity to “turn yourself in.” Generally, this is a good time to contact a Norwalk domestic violence defense lawyer who can help you arrange a bail bond’s man and assist you with the process of turning yourself in. When the Police make an arrest “on site” they have several options on how to proceed with the procedure. The first, for situations that did not involve the use or threatened use of a firearm, is a “summons” arrest. In this case the Police officer can just issue you a misdemeanor summons form requiring that you attend a Court appearance the next morning. A lot of people get confused when they receive a “summons” arrest because it looks and feels a lot like a speeding ticket and they often think that they were never arrested. Make no mistake, a summons arrest is a misdemeanor arrest and you will receive a permanent criminal record for a misdemeanor arrest. As with any domestic violence arrest you will be required to attend Court the next business morning for a domestic violence arraignment. The second option which is utilized in most domestic violence matters is the so called “custodial arrest.” This type of arrest means that the Police put handcuffs on you, place you in a Police car, take you down to the Police station and put you through the booking process for your charges. The Police will fingerprint you, take your photograph, make notes of all your basic demographic information which gets forwarded to the FBI and you get a FBI criminal arrest record. If you have been arrested on a warrant, all arrests are custodial arrests. Whether you turn yourself into the Police station or if they apprehend you and take you into custody on an arrest warrant they will process you on a custodial arrest. In domestic violence matters in which “on site” arrests are made the Police are instructed to take into consideration the imminent safety concerns of the victim. In non-violent situations such as preach of peace and disorderly conduct arrests often the Police can release you on a written promise to arrear which requires no money to be released. You will simply sign a written document which indicates your promise to appear at Court for your arraignment. However, in the vast majority of “on site” domestic violence arrests some form of monetary bond is required. In most cases the bond amount is determined by the Desk Sargent who takes into consideration the past criminal history of the accused and the allegations of the crime itself in setting the bond. In most cases the bond amount set is either cash or surety. This means that you can either post the cash in full and be released or work with a bail bonds man who will post the bond for you in exchange for a premium which can vary greatly from one bond agency to another. The bondsperson charges a fee which is a percentage of the total bond amount which is their payment for posting your bond. The difference when using a bondsman is that you do not get back the fee that you pay the bondsman that is their payment for posting your bond. The bondsman will then make arrangements to file the appropriate paperwork to post the remainder of your bond and they are responsible for paying your bond if you fail to appear in Court or locating you and brining you to Court. My advice is to call around to a few different bond agencies and find the best price. If you would like assistance in arranging for your bail bond feel free to contact our office we will be willing to assist you in working with the Police and coordinating a bail bond agent to get you processed quickly and back out on the street. If the arrest is by a warrant then the Judge may have already set the amount of your bond in advance. Although in some instances the Judge’s will leave it to the discretion of the arresting agency to set the bond upon executing the arrest. Upon a Police arrest for a domestic violence case if the Police feel that there are some victim safety concerns they are authorized to issue a temporary order of protection that will take effect immediately and remain in effect until your arraignment in Court on the next business day. It is very important to realize that although the issuance of this document is very informal if you violate the terms of the temporary order of protection you can be charged with an additional criminal offense. It is important to abide by the terms of the temporary order of protection as if you violate it will not only expose you to additional criminal charges but in addition it is going to result in more severe and restrictive terms of release and orders of condition when you reach Court for your arraignment. Every domestic violence arrest requires that the Defendant be presented before the Superior Court for a mandatory arraignment on the next day that Court is open. It is highly recommended that you retain the services of a Norwalk domestic violence defense lawyer to provide legal representation at your arraignment. In the vast majority of situations the issuance of a temporary restraining order is issued by Police to restrict one of the parties from returning to the family home until the Court arraignment and from having any contact with the victims. Your best course of action at this point if you can is use your smart phone and do a google search and find an experienced Norwalk domestic violence defense lawyer who can bring you up to speed on what to expect on your visit to Court during your next day arraignment, give you some advice on some defense strategies and take any steps needed to preserve any exculpatory evidence such as video surveillance of photos that may exist of the crime or any injuries sustained. Why Hire the Law Offices of Allan F. Friedman? Contact a Norwalk Domestic Violence Defense Attorney Today! If you have been charged with a domestic violence crime in Fairfield County, Norwalk Attorney Allan F. Friedman will take the time to answer all of your questions and give you sound legal advice. Attorney Friedman will work hard to put together a winning defense strategy to defend you. He provides each of his clients with personal attention and clear communication, and his rates are reasonable and he offers payment plans. Norwalk domestic violence defense attorney Allan F. Friedman also represents people in Stamford, Darien, Weston, Greenwich, Bridgeport, Westport, Fairfield, Wilton, Cos Cob, New Canaan, and Easton among other Connecticut cities. Our office is conveniently located right off exit 13 on Richards Avenue in Norwalk. We also have an office located in downtown Stamford one block from the Stamford Courthouse at 24 Hoyt Street. Call us at 203.515.4110 or contact us via our online form to schedule an appointment.